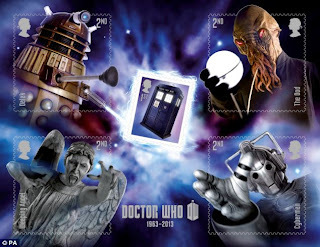 March 26 2013, will see Royal Mail celebrate the 50th anniversary of the world’s longest running science fiction series in TV history – Doctor Who – with the launch of a special set of 11 stamps. 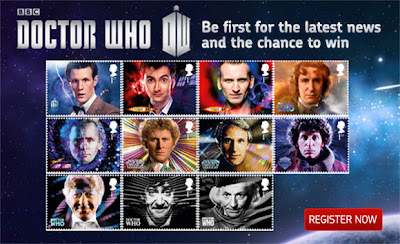 In addition to the 11 stamps featuring the Doctors, a five stamp miniature sheet will also be available. In the centre of the sheet is a stamp featuring the Doctor’s space and time travelling machine, the world famous Time and Relative Dimension in Space or the TARDIS as it is more commonly known. an ood? really? i love that they're doing this, but i would've thought a classic monster would make the cut over the ood. the master? the ice warriors? kandyman?